Coupon Cravings is reporting a hidden Register Reward deal running at Walgreens though at least the end of the week, maybe the end of the month. Check out this week’s Walgreens deals here. I am no longer shopping at walgreens, I went there today to get a register rewards deal, and apparently now, if you use any rr's to pay with you do not get your rr! The manager was super nice, but said that has been happening about the last week now, so heads up. 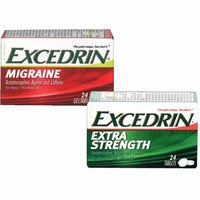 This wasn't hidden at the Milwaukie Marketplace Walgreens, I got 2 Excedrin Tension Headaches for free.